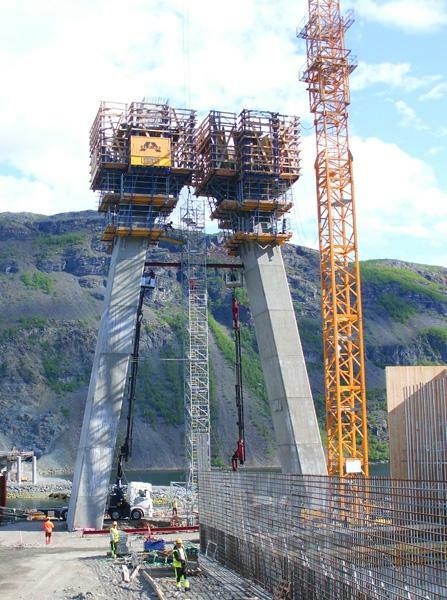 On the Kåfjord, near Alta in Norway, the construction group ALPINE is currently erecting the northernmost bridge pylon ever to be formed by Doka. The greatest challenge in the building of this 270 m long bridge is the harsh climatic conditions that prevail at this geographically exposed location: working winds of 80 km/h and storm winds of up to 170 km/h are not uncommon here. Nevertheless, a high-performing Doka formwork solution using SKE50 automatic climbers is keeping work moving ahead swiftly and safely. In the far north of Norway – 80 km south of Hammerfest and around 1300 km north-east of Oslo – the Salzburg, Austria, based construction group ALPINE is building a 270 m long and 8.5 m wide single-tower cable-stayed bridge across the Kåfjord. 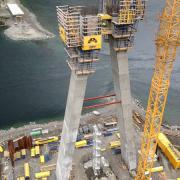 Doka is supplying a dependable, high-performing formwork solution for building the A-shaped pylon and its foundations, together with the foreland bridge. As well as a track-record of successful collaboration on previous projects, a key reason why the client awarded the contract to Doka was the company’s high capability and expertise in the field of technically demanding automatic-climbing projects. 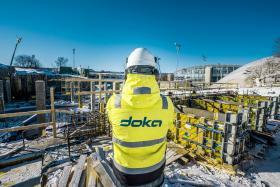 Doka also scored highly for its knowledge of the difficulties of working in this region, and for the fact that its Trondheim branch gives it a ‘relatively’ local presence. 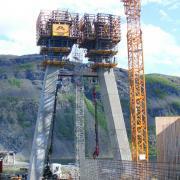 Two special challenges make the Kåfjordbrua a particularly interesting project. Firstly, the province of Finnmark, in which Alta lies, counts a mere 1.5 inhabitants per square kilometre, making it one of the most sparsely populated regions of Norway; it is also one of the remotest (1400 km from Trondheim by road). This has made it absolutely imperative for the site logistics and the deliveries logistics to be seamlessly and flawlessly co-ordinated between the Doka branch in Trondheim and the site team in Alta, right from the beginning of the project. “The vast distances make transport very cost-intensive, so we can’t afford to waste a single metre of loading space”, says Doka project manager Andreas Heimberger. Secondly, the wind-speeds encountered out in the fjord, with working winds of 80 km/h and storm winds of up to 170 km/h, are so high that the safety requirements made of the equipment fielded here are very stringent indeed. To help it ‘rise’ to the challenging conditions applying to the building of the 72.5 m high pylon, ALPINE opted for the self-climbing formwork system SKE50 plus, which adjusts readily to difficult structure geometries. Nine ‘SKE50 plus’ automatic climbers, combined with 63 m² of specially tailored Large-area formwork Top 50, are being climbed in a weekly cycle to construct the pylon legs, both of which incline by ten degrees from the vertical. Following modifications to the dismounted platforms, eight ‘SKE50 plus’ automatic climbers remain in use on the head of the pylon. The automatic climbers of the end faces do not need to be modified, as they can continue climbing unhindered right through until the top of the pylon. The block height of the legs is 4 m up until the point where they merge, and 2.5 m thereafter. The bridge superstructure is being constructed using the cantilever method, and Framed formwork Framax was used for the foundations of the pylon. Particularly great precision is required with placing the tensioning cables in the ballast box at the short end of the bridge. To ensure sufficient adaptability to the shape, Large-area formwork Top 50 was selected for this. 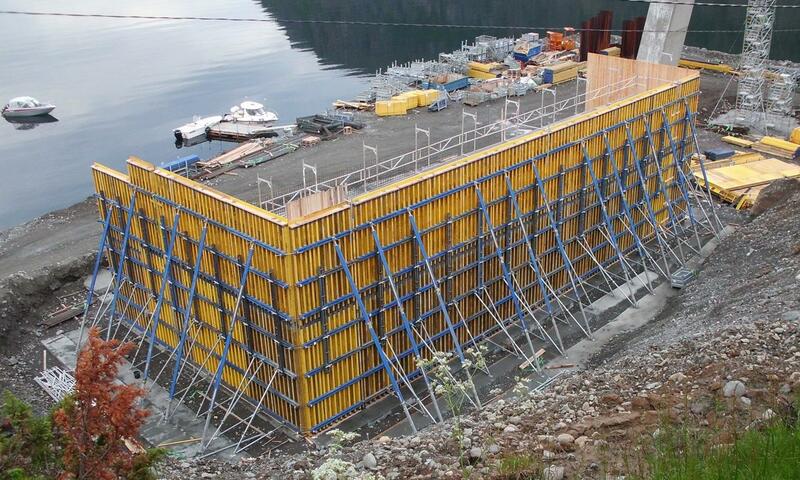 The ballast box is being cast in two steps, with the outside formwork staying in position for both casting-steps so as to ensure exact placing of the tensioning cables. “For us, Doka automatic climbing formwork SKE50 plus is the most efficient solution there is for building this bridge pylon efficiently and quickly. In particular, being able to jump the formwork units so quickly using hydraulic cylinders, and close and open the formwork in such a straightforward way, really helps work to move ahead fast”, comments Alpine supervisor Stefan Ebenbauer, summing up their positive experience with Doka automatic climbing formwork SKE50 plus. 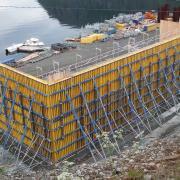 The high safety standard of the Doka automatic climbing formwork has also greatly impressed the Alpine team. All four work-deck levels are railed in at all times – even during climbing. “Because the climbing scaffolds are always firmly anchored in the concrete, the platforms can be ‘climbed’ safely even under high wind loads. The working platforms are generously sized and are fully railed-in, with ladderways permanently integrated in the climbing units, so we can always be sure of working in safe conditions”, adds Alpine foreman Herbert Etzold. 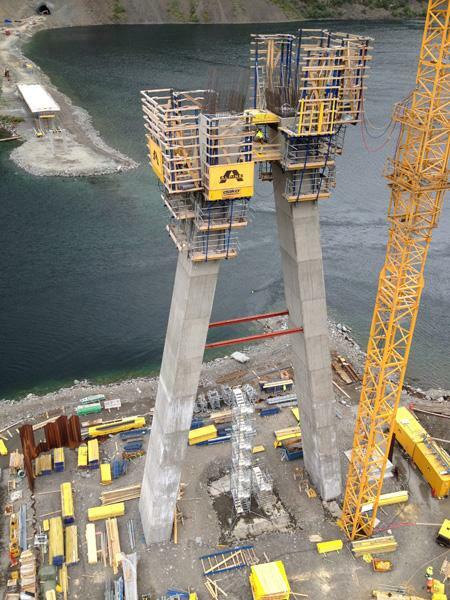 A combination of Large-area formwork Top 50 and Staxo 100 load-bearing towers is being used to form the superstructure of the 101 m long foreland bridge. To make it unnecessary to deliver any extra formwork equipment for the six circular pillars of the foreland bridge, it was decided to re-use the Framax framed formwork that was already on-site following completion of the abutments. Profiled timber formers were added to this Framax equipment, enabling the pillars to be cast in the desired concrete quality. Thank you for your interest - A-shaped pylon rising amidst the stormy winds of Norway. Thank you very much for your interest - A-shaped pylon rising amidst the stormy winds of Norway.